Qualfon released the results of a survey that shows 82% of employees would recommend working at Qualfon to a friend or family member. The You Matter with Mike survey polled employees at all levels of the company, and the majority are pleased with Qualfon as an employer. That “sense of family” is exactly what executives believe is driving employee satisfaction. 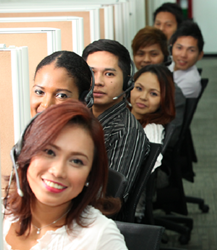 Qualfon has been building the company culture around its mission: “Be the best BPO. Make people’s lives better.” Over the past five years particularly, the Qualfon Mission Office has made significant investments in each person, rolling out a comprehensive system of services to support employees, families, and communities. Mission Office programs are designed to care for employees personally and professionally, developing their total vocation—not just as employees but also as individuals and members of society. The benefits range from free chaplain services and educational opportunities to employee-run fun clubs and ways to get involved with local charitable organizations. In a written statement announcing the results to supervisors and managers, Marrow credited the leadership team for being ambassadors of the company mission. “You are doing a good job in making Qualfon meaningful to our employees, their families, and the communities where we work. Thank you very much for all that you do each and every day!” he wrote. The recommendation rate is seen as progress for the company, but Marrow challenges management to now strive for even higher marks. “We’re seeing consistent recommendation rates that give us a reliable measuring stick and show us how we are doing in our never-ending journey to make lives better. This a solid achievement, and now we will aim even higher,” added Marrow. Every two weeks, Qualfon sends a one-question survey to all employees. Called the You Matter with Mike survey, the quick-poll keeps a finger on the pulse of employee satisfaction and offers an open line of communication with the CEO himself. For the past three years, Qualfon has used the responses, including open comments from employees, to drive workplace improvements.